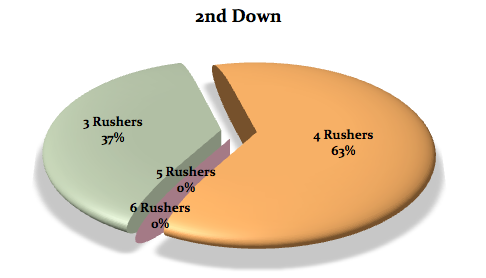 Kiffin Report: Coach Jones Orders More Blitzes! In preparation to take on the Green Bay Packers – with or without Aaron Rodgers – the Cowboys have been playing a fun game of “discussing strategy in public”, authored by the world’s most famous (fantasy) football owner in the whole world, Jerry Jones. Monte may not have had the numbers right in front of him, so allow me to help. On Monday night, facing 10 3rd Downs, the Cowboys blitzed twice. 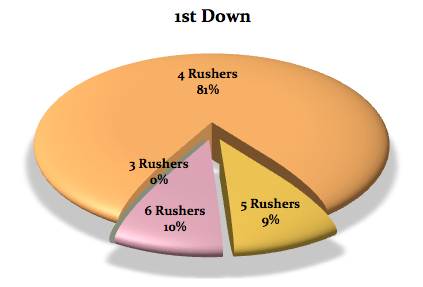 For the year, they blitz 18% of the time (down from 24% in 2012), with 16% of the time on 1st Down, 9% on 2nd, and 30% on 3rd Down all season long. The Cowboys don’t blitz much. They don’t blitz much for a number of reasons that make a fair amount of sense, starting with the idea that Monte Kiffin does not believe in the blitz. He never has. He has used it, but only as frosting, never as the cake. Why? Because he knows in this league that blitzing as a weapon can be dangerous, but as a necessity it can get you killed a whole lot faster. He also doesn’t seem to have ideal personnel for blitzing and ideal coverage to handle blitzing behind that. But, you are surely saying as you read this, Bob, this might be the most horrific defense in league history. Whatever they are doing isn’t working. Why would it hurt to try something different? I can’t argue. What they are doing – although sound in reasoning – isn’t working. But, that doesn’t mean that they aren’t presently selecting their best option. More blitzes, says Coach Jones. He sits in his booth and sees too many zones that are getting barbecued as his 4 man rush doesn’t accomplish anything. But, my numbers show 4 sacks on 106 blitzes this season for 3.7% sack rate (the NFL average is 9% on blitzes). Non blitz: 23 sacks in 458 rushes: 5.0%. As you can see, they haven’t had a blitzing sack since Week 3. 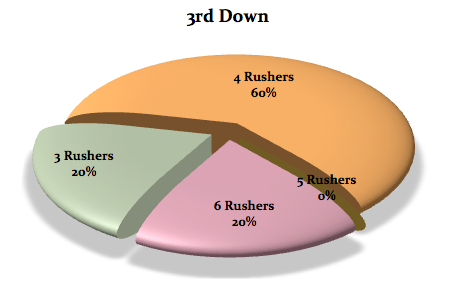 In fact, of their 27 sacks, 23 of them were with just the front 4 (85%) and 4 were with 5 or 6 rushers (15%). Even worse, just 9 of their sacks are on 3rd Down – where most teams get the majority of their sacks and get off the field to stop drives. 9 ranks 28th in the league on the money down. So, is this because they aren’t blitzing at all? No. 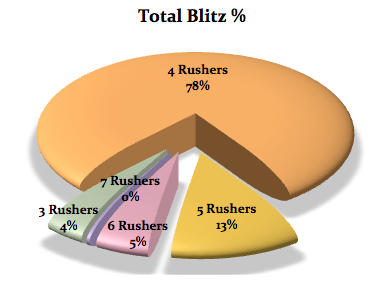 They have tried 106 blitzes by my count this year (the NFL claims they have tried 107) and have 4 sacks to show for it. But, Bob, there are other effects of blitzing: Hurried throws, hits, frantic incompletions, and other positives. What are the results of those numbers? Well, I am happy you asked. NFL QBs are 67 of 101 for 952 yards and 5 TDs and just 1 INT against the Cowboys blitz this year for a stupendous QB rating of 109.1, which would rate them dead last in the NFL at 32nd in a 32 team league. When they don’t blitz, the Cowboys are still doing poorly. But, the opposing QB rating is 91.8 instead of 109.1. The numbers are still staggering: 272 of 420 for 3124 yards, 21 TDs, 12 INTs, but better when they are dropping into coverage. 91 isn’t great (league average this year is 87), but 109 is last in the league. But, Jerry thinks the blitz is the play, does he? I realize the issue is the front 4 isn’t getting there anymore. They had 13 sacks in the first 3 weeks of the season, and just 14 sacks since. They have more sacks than only 3 teams in the league and are not anywhere near the top half of the league. The biggest question about this unit and the players they are getting huge contributions from is whether it is possibly sustainable. Are these players candidates to still be making plays at this time in 2014 or 2015, or will the Cowboys need to spend 1st and 2nd round picks or mega-contracts to get permanent solutions at these spots? Obviously, odds are that you don’t find too much treasure in the NFL trash. These are not undrafted free agents from college; these are players who have been employed by 4 or 5 different organizations and have been declared washouts in the NFL. Despite being 26, they are already in the “old bin” and most teams would rather take a shot on a 22 year old. We have seen a major regression from George Selvie and Nick Hayden, with others just flat out disappearing from whence they came (Everette Brown). The front 4 is now hoping DeMarcus Ware still can work his magic and Jason Hatcher can keep earning his money for next year. But, talk about a rock and a hard place. Do they blitz – something they are the 32nd best team in the NFL at doing – or do they keep getting rocked because they have no pass rush with 4? Blitzing seems like a good idea, but only if you can get home. If you don’t, you are outnumbered in the secondary and are counting on your guys to run man to man with talented receivers with almost no help. Here is a good case of that as Brandon Marshall from the slot just runs a simple dig to lose Brandon Carr and gains an easy 19 yards against a blitz that didn’t get home. And why doesn’t it get home? Well, partly because the Bears keep more guys in to protect, and partly because your blitzes have to be good at blitzing. Barry Church might be the best blitzer on the roster, but I am not sure he is great at blitzing. Regardless, Josh McCown has time and space and delivers a throw that shows that even on 1st Down, your blitz doesn’t trouble them. Here is a 6-man blitz that is burned brilliantly. The Cowboys are bringing the safety and the linebacker to Bush’s side and assuming he is staying in to protect – but if he doesn’t, George Selvie must hit the brakes and peel off to “cover him”. Church has a free run at the QB, but he is so prepared that he puts this throw in a perfect spot to kill the blitz and it is a easy stroll to the end zone. Wow. Talk about getting your mitts burned. And despite seeing that play, Jerry wants more! 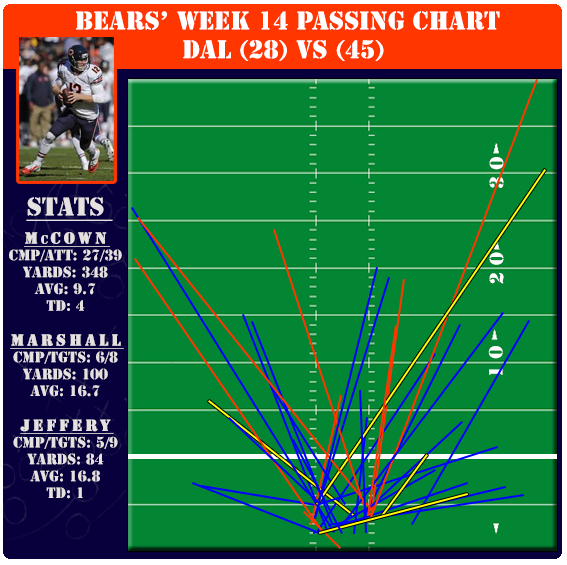 Against the Bears, the team clearly feared Alshon Jeffrey and Brandon Marshall more than they wished to blitz and therefore attempted to play coverage most of the time. The Dallas blitz rate in this game was the lowest since the San Diego game. They built a game plan around NOT blitzing and it didn’t work. So, if one extreme doesn’t work, one rich man thinks the opposite approach might work. Careful what you wish for. Josh McCown certainly did not conduct himself like you would believe a backup QB would do. 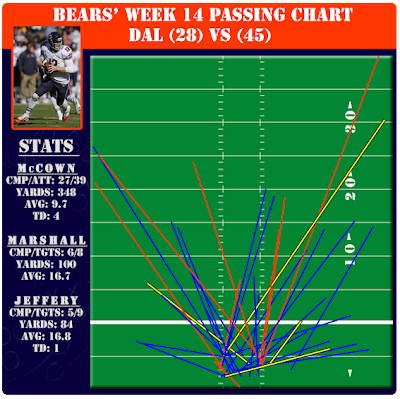 McCown was really fantastic and among the best QB performances Dallas has seen all year. SUMMARY: I expect the Cowboys will blitz more than they have all season on Sunday against a team that has one win in their last 6 games. It might work, because Green Bay has very little self confidence and you could certainly argue they are ripe for the picking – especially if #12 isn’t under center for them. But, the larger issue here is that they are about to do something that A) they are very poor at (as mentioned above, they are the single worst blitzing team in the entire sport, B) they just fired a guy who is great at blitzing, and C) they just hired a guy who has never believed much in blitzing at the expense of weakening his coverage options. The bottom line is that defensively they ran into a few buzz-saws that presented matchup issues for the Dallas personnel. Hopefully, by now you know my view on how poor a job the GM and his staff did on assisting the defense by getting them quality personnel to fortify this unit. If not, the archives are full of them, including the piece from 2 days ago. My position is that they are playing a depleted Green Bay team at home and then a horrid Washington team and I believe I would place both of those teams in the Giants and Raiders category, where you can still play poor defense and overcome it with a strong team game, rather than the Saints and Bears where you need to start gambling without hesitation. Wait to gamble until Week 17 if you must, when you play an equally aggressive Eagles team that might have you in binds with their personnel and Xs and Os. But, Jerry has never come to me for advice, and since he is the only one who matters in this discussion, I believe we should expect a season-high blitzes and hope for the best. He is a wildcatter by trade. And that leopard is not going to be changing his spots in 2013.